Beerstorming is not about making the next top-selling beer. Nor even about brewing in its most literal sense. It’s about creativity in brewing. About being a part of an experience. About tastes, memories and stories you can share over a beer. Or two. Beerstorming is your invitation to an evening where you can exchange ideas, opinions and desires on new brewing projects in an extremely small brewery. Under the guidance of an expert brewer, you will be introduced to the more intricate details of brewing so you can create your own beer. Discover the playground of our brewer. He will tell you as much as possible about how it works. 4 special beers, brewed at our miniature brewery. 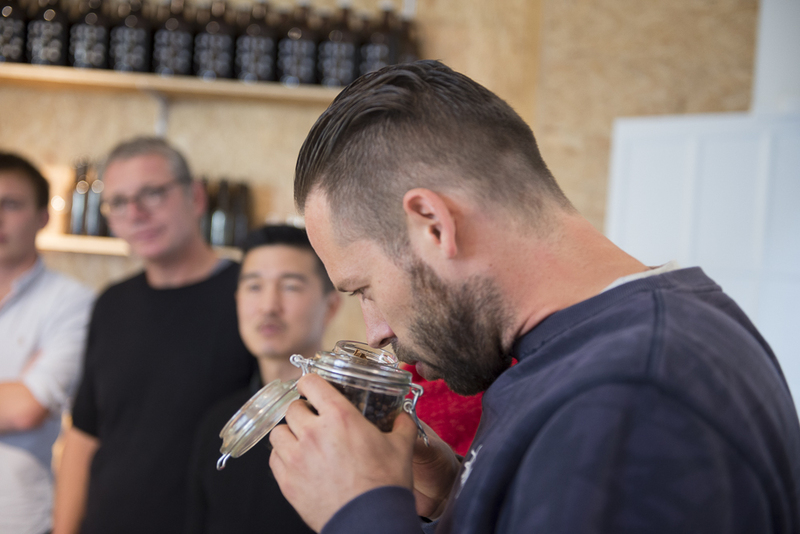 This unique experience will teach you and 7 to 14 friends, colleagues or relatives how to brew your own beer. You will discuss ideas, choose ingredients, develop a recipe and start brewing. At every stage you’ll discover new tastes, flavours and smells you have never experienced before. Additionally, you will get some delicious tapas and a full meal. After 2 months of maturation, we will be able to get some of your own craft beer. to brew, and more importantly: its taste? your very own beer. Tapas and dinner are included. Many stories will be written in the Beerstorming workshop over the next months. Each of these stories deserves a happy ending. But not every story will become a reality.Their fate lies in your hands, as you can vote for every beer that will be made at our brewery. All it takes is one click on the like-button under your favorite beer. Once it has been decided which five beers are the most popular ones, a jury will taste each brew. They will judge wisely and discuss without moderation. The beer with the most potential to become a sensation among beer drinking Belgium, will find its happy ending in specialized stores, and its inventors will get a share of the production. Recruit your relatives, friends and colleagues to help your beer become a reality by voting for your creation. Beers is on the rise around the world. More and more breweries are opening and innovating in order to discover the infinity of possibilities that beer offer us. Our desire is to initiate everyone that enter is our brewery to that varied world of beer. To do so, we arm ourselves with our mashing rake, quality ingredients and our beer knowledge to show our the beauty of brewing. As Beerstorming, we love to innovate and create crazy beers from wacky ideas but foremost, we like to brew a variety of different styles, whether traitional or experimental to delight every palate. Climate impact have been since the beginning of Beerstorming’s story, an important issue. We are proud to have the first ever CO2 Neutral beer in the country. Une série d’actions, comme passer entièrement en énergie verte, l’utilisation de nos growlers réutilisables, véhicules électriques et bien d’autres ont été mis en place afin de réduire cet impact. Concerned about our ecological impact, we worked with CO2 Logic, an independent consulting firm specialized in climate issues in order to analyze our carbon impact, reduce and offset it.... A series of actions has been taken to reduce our CO2 impact, like for instance, switching entirely to green energy, the use of our reusable growlers, electric vehicles and many others. Despite the efforts made, there is still a certain level of emissions. We decided to compensate these by supporting Gold Standard certified environmental projects. Beerstorming's calculation and CO2 reductions are calculated by CO2logic and verified by the independent organization Vinçotte. The selected project is called "Saving Trees" to reduce carbon impact and deforestation in Uganda. don’t forget to share your experience with the hashtag #beerstormingbxl.